Welcome Heroes, to the Spring Season of the Overwatch Campus Clash! Assemble a team of Overwatch players from your university and compete for your chance to win a VIP trip LA and watch the Overwatch League Live and hang out with your favourite pros! Each university may field an unlimited number of teams with any skill range, as each team will be seeded to create fair and competitive games. Gather up your fellow students and participate in our Spring Stage to gain crucial points, as well as opportunities to pick up Blizzard goodies! You can view the full rules document here. Map Selection should be done using pre-game lobby chat. All results should be submitted using tournament companion. If the series ends in a tie, teams are to a play a deciding match on Oasis. Control: Busan / Ilios / Lijiang Tower. Tiebreaker map will take place on the remaining control map that was not played during the original best-of-five series. The tournament consists of five (5) weeks of Swiss consisting of two (2) best of three (BO3) games each week. The top 8 will then qualify into playoffs with the remaining teams continuing the Swiss for three (3) weeks for the first place Swiss prize. Tournament nights are every Monday with check ins required ensure that you’re provided matches for that day. After the end of the Spring Swiss Stage there will be a Grand finals for the two best performing teams. This will be based off the results of the top 8 positions from each split. See the Championship Points tab for more information. 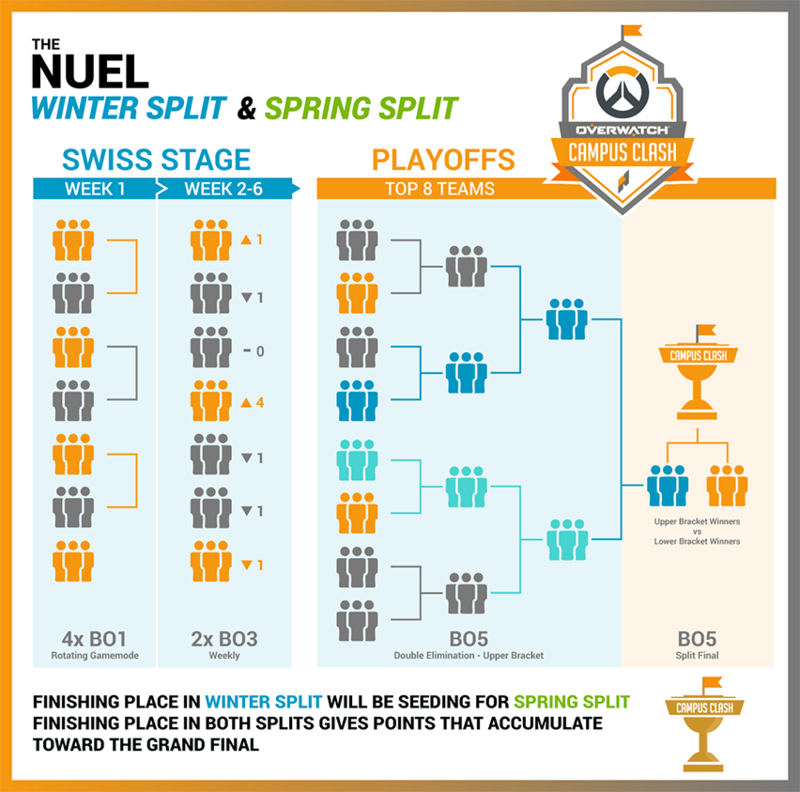 The top 8 teams from each split receive Championship Points based on their Winter playoffs finishing position and Spring Awiss finishing position. See tables below for the current standings and the points that teams will receive for the Spring swiss.